hike itself is quite easy with clearly-marked trail. The harder parts are if you choose to go down the multitude of steps that lead you to a shore area and to the mini-maze. The steps are clean and most beautiful of all are the rocks and caves. You will find plenty of shade along the trail so it is not too hot but don’t forget to bring water. . I saw quite a few people bringing their packed lunch. I really enjoy quiet time taking in these spectacular views. Depending on the seasons, make sure to carry a light windbreaker, scarf and hat. The wind will get fierce, and you will get cold. It might also be worth your while to bring flash lights if you decide to stay back until sunset. The Lands End portion consists of a lovely roadside park with gorgeous tall trees with a very high canopy. There is a historic diner on the route, which was also part of the historic Sutro Baths. The backside of the seawall has graffiti all along it, but it is kind of interesting, not tacky. These works of art have put up there over time. You can hike down to the water, or simply just enjoy the view from the higher trail. From Land’s End Look Out, you can go back up to the trail head and walk around the corner towards the Golden Gate. The view is absolutely stunning provided it is a clear day. According to the tourist centre at Lands End, it will take 3 hours to get from China Beach to the Cliff House and return; however it took me longer as I had many stops along the way. Other places not to be missed are USS San Francisco Memorial, Lands End Point, Labyrinth at Lands End, Mile Rock Beach, Mile Rock Lighthouse, Eagle’s Point and Shipwreck Remains, Scenic viewpoint of Marin County, Point Bonita lighthouse, Golden Gate Bridge, China Beach. The breathtaking view is pretty much the whole way. This information is readily available at the Tourist Centre at Lands End. I read at the Tourist Centre that this headland that border the Golden Gate have always challenged developers. The rocky exposed bluffs, often windswept and cloaked in fog, have hampered attempts to tame this corner of San Francisco. Despite the terrain, this section of the Coastal Trail was once a railroad bed, and the adjacent street, El Camino del Mark, once extended through Lands End. The two roads led to the Cliff House, Sutro Baths and Ocean Beach. Landslides eventually closed both routes. Seal Rocks is only famous because back in 1887, at Adolph Sutro’s urging, Congress designated Seal Rocks a marine preserve–one of the nation’s first–to protect the colony of sea lions that resided there. The colony has since moved around the Golden Gate to Pier 39, but you can still spot sea lions and seals off Lands End. At the tip of Lands End is Point Lobos, named by the Spanish for its many lobos marinos (sea wolves); the barks of those sea lions, as they are called today, drifted up from the rocks below. It is located in the direction of the Cliff House Restaurant. The Sutro Baths were a large public bath house constructed in 1896 and served the San Francisco community until 1966 when the building burned down. 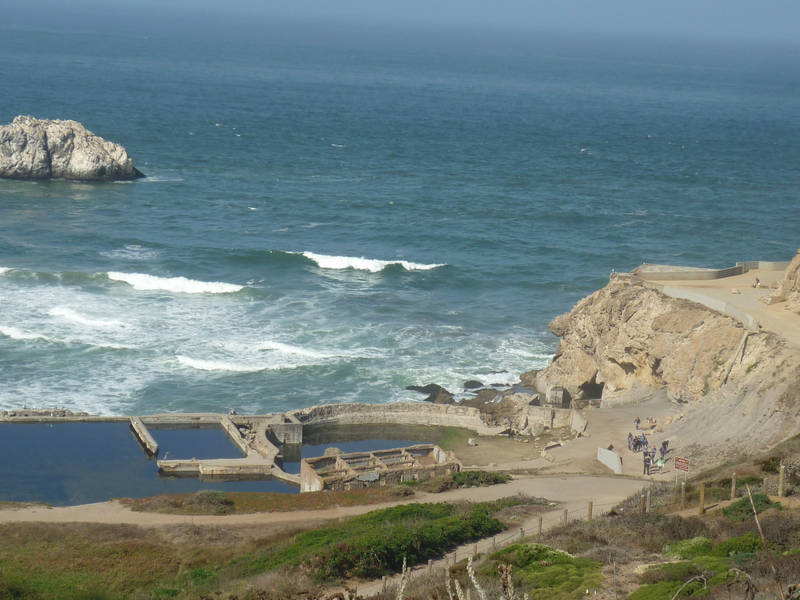 This historically protected ruins of the once grand Sutro Baths built by Adolph Sutro. Sutro had been developing the project for years, attempting four separate times to insulate the site from waves using sea walls, the first three of which collapsed into the Pacific Ocean. On March 14, 1896 the Sutro Baths finally opened to a dazzled public at a cost of more than $500,000. Spread over three acres, the artistic detail and engineering ingenuity were impressive. According to tourist information, a classic Greek portal opened to a massive glass enclosure containing one fresh water tank and six salt-water tanks, all at various temperatures. Together the pools held 1,685,000 gallons of seawater and could be filled or emptied in one hour by the high or low tides. There were 20,000 bathing suits and 40,000 towels for rent as well as slides, trapezes, springboards, and a high dive for up to 1,600 bathers. There is a small tunnel you can walk through under the main platform to see the waves crashing on the nearby rocks. From Sutro Bath, you can hike to the Legion of Honor & back. This walk should not take you longer than 1.5hrs. All you have to do is walk down a flight of stairs to get to Sutro baths from the lower parking. You can sit down and take a breather and take more photos at Eagles Point, at the east end of Lands End (a wooden viewing platform and staircase on the cliff face provides a magnificent view of the entire Golden Gate). El Camino del Mar and the Lands End parking lot also offer great photo opportunities. 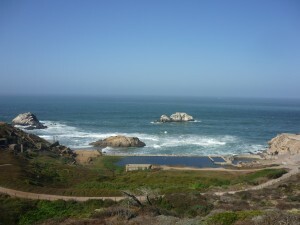 Here you can view the Sutro Baths, Cliff House, Seal Rocks and Pacific Ocean. The USS San Francisco Memorial honours those who fought on the navy cruiser that spearheaded the naval battle of Guadalcanal in World War II. The ship sustained 45 hits in combat. The names of 107 men lost in the battle are engraved in the memorial, flanked by part of the actual shell-riddled bridge of the warship. You can walk around the memorial by following the Coastal Trail to the stairs leading up to the Fort Miley vista area or drive in along El Camino del Mar. You can see the remains of three historic shipwrecks at the Mile Rock overlook at the end of the paved segment of the Coastal Trail. At low tides the wrecks of the Ohioan, Lyman Stewart and Frank Buck can be seen if you look northwest, at the shoreline. The Labyrinth is a replica of the seven-circuit Chartres labyrinth, created in 2004 by a man named Eduardo Aguilera, who has built other, similar sites around the Bay Area. 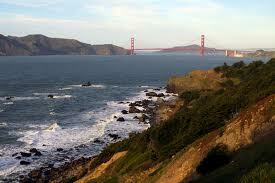 This spot also offers great views of the Marin Headlands across the bay and the Golden Gate Bridge in the distance. Take your time to walk the maze as this place is one of the amazing spot at Land’s End Point. About halfway along the trail you will reach an optional detour that allows you to walk to the Labyrinth. Go all the way around the point, because you won’t see the labyrinth until you’re right there. To get a really great photo of the labyrinth, stand up on the point and shoot downwards. Once you have reached the other end of the Lands End Trail you can either walk back along the same route or walk along the road that leads through the golf course past the Palace of Legion of Honour Museum. There are many parking spots and best of all, they are free. You can park at El Camino del Mar, north of Point Lobos and 48th Street or at 32nd and El Camino del Mar. Yyou can also park at the Legion of Honor and visit the Legion of Honor Museum Store where there are a good selection of art books, gifts, stationery, posters, prints, and children items. Admission fee is applicable to enter the museum. However if you are driving towards China Beach Park, park immediately right at the entrance of Coastal Trail between China Beach and Mile Rock Beach. That way, you will get to see beaches, the labyrinth, the Sutro Baths Ruins, and beautiful panoramic views of the Golden Gate Bridge. 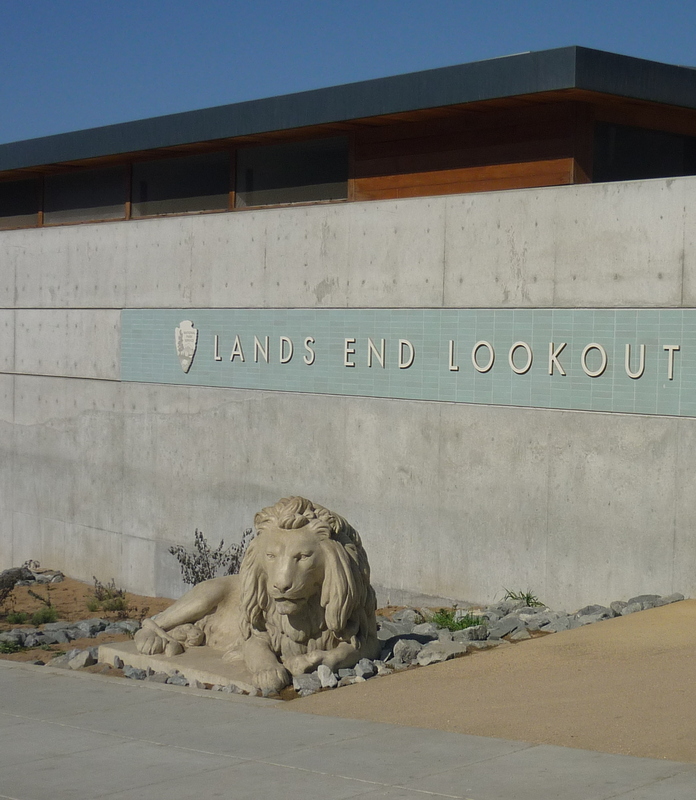 If you are driving towards Gleary Boulevard/Point Lobos direction, you can park at Lands End Main Parking Lot, Merrie Way. You will see a Lands End tourist information centre there. Sutro Bath is next to the tourist information area. I consider this to be the best spot to park as you can grab a map from the Tourist Information Centre and ask question as to the best way to enjoy the area depending on your time constraint. You can cycle here too and there are clear signs The Coastal Trail is clearly marked; bikes/no bikes. Note that bbicycles are not permitted on open terrain of the Coastal Trail between Pointed Rock access road and Eagles’ point; Coastal Trail bikers can bypass that gap by using El Camino del Mar. The first half mile of the trail is paved and level (intended to be wheelchair accessible). Check with the Tourist Centre. If you don’t have a car, take the local bus #38 from downtown towards land end, then walked from the bus stop to the end of 48th Avenue.Get yourself a muni passport it is well worth it and the buses are included in the muni pass. However youu can’t take your bike all the way to the bridge from here, but you can ride through the ‘bike only’ sections of the trail, or lock it up in the parking lot and walk for about 3 miles on a fairly easy walking pace. There are two staircases on the trail itself, but lots of trees, shaded areas and scenic views and photo opportunities to enjoy along the way. Take the bus to Lands End and take the bus home at the other end. 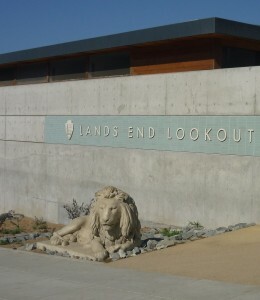 Dogs are permitted on only designated trails at Lands End and beach areas. In my personal opinion, the best time to arrive here is before noon, on weekdays as weekends tend to be very busy. Here you can spend approximately 1.5-2 hours hiking around, checking out the scenery, and also seeing the Sutro Bath under Cliff House, then having brunch either at Cliff House, Louis’ or Seal Rock Inn. Another restaurant not overprice is the Louis’ Restaurant where I reckon has the best views of Lands End, Marin Headlands and the Pacific Ocean. They serve breakfast & lunch and the food is only average. The first thing I did after getting off the bus was to check out the tourist centre for maps and information. The center has books Sutro baths and Lands End. On the right side is the nice maze that everyone has a picture of. According to my information, in 1896, the Sutro Baths were opened to the public as the world’s largest indoor swimming pool. Visitors had a choice of seven different swimming pools that were ostentatious in appearance and style; with private dressing rooms, toboggan slides and the ability to accommodate 25,000 people! The baths were so expensive to operate that they were closed in 1965, and then the building itself was burnt to the ground in 1966. 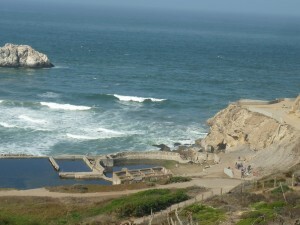 I walked toward the Cliff House which overlooks the Sutro Baths. The Cliff House Restaurant is itself a San Francisco landmark. It began in 1858 with an amazing history. You can read about the cliff House from 1863, 1896, 1909 and 2004 and later had brunch at Louis’ Restaurant. After inspection the views from Cliff House & Seal Rocks, I walked back to the Tourist Information Centre and proceed to walk done the flights of steps towards the Sutro Bath and towards the Legion of Honor. This trail is truly an amazing place. As I passed the Sutro Bath, I walked through the forest, enjoyed the fresh air, listen to the ocean waves and saw the WWII memorial. I also saw locals running; doing survival training and climbing trees, then went inside the cave to explore the end of the trail. Enjoyed the cave, the Lands End’s labyrinth, which was originally created by Eduardo Aguilera in 2004 was for meditation purposes. It was a lot of fun walking in the maze. Another fleet of stairs took us to the Mile Rock Beach. It took me 3 hours to get from Cliff House to China Beach and return. I read about the Camera Obscura. It was not open when I was there. If you are not interested in having lunch at the Cliff House, it is still worth your while to visit seal rocks at Lands end. 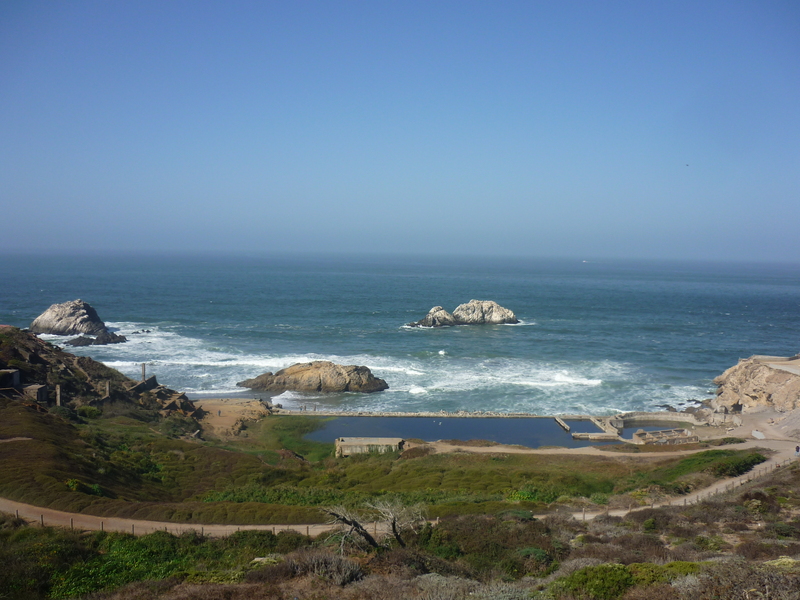 In fact if you don’t have time, just visit check out seal rocks & Sutro Baths at lands end. In my personal opinion, seal rocks at lands end and the cliff House are both worth a visit. Unlike Golden Gate Park, this place is not frequent by tourist yet. It is probably because it is off the beaten track but if you have the time, I suggest you make the effort to visit Lands End. This place is well populated, so if you re by yourself, fear not, as it is pretty safe. 1) San Diego Old Town, California, USA. 2) George Lucas Star Wars Headquarter, San Francisco, California, USA. .
3) Presidio, San Francisco, California, USA. .
4) “Painted Ladies” at Alamo Square, San Francisco, California, USA. 5) Museum of Fine Arts, San Francisco, California, USA. 6) Alcatraz, San Francisco, USA. 7) Gay and Lesbian suburb in Castro, San Francisco, California, USA. World Most Crocked Street, San Francisco, California, USA.